Is Turkey Still Arming Islamic State? Originally published under the title, "Turkey: Not-Quite Rule of Law." Ali Babacan, a world-renowned economist and Turkey's mild-mannered Deputy Prime Minister, put it realistically in a recent speech: "Public trust in the justice system is in steady decline." How could it not be? Turkey has finally become a country where prosecutors and law enforcement authorities get indicted rather than indict suspects. The latest episode unveils how Turkey's Islamist government not-so-secretly supported the radical Islamists in Syria. On Jan. 19, 2014, the Turkish gendarmerie command stopped and searched three trucks in southern Turkey, heading for Syria. Accompanying the trucks were Turkish intelligence officers, and the trucks had a bizarre cargo: In the first container, 25-30 missiles or rockets and 10-15 crates loaded with ammunition; in the second, 20-25 missiles or rockets, 20-25 crates of mortar rounds and anti-aircraft ammunition in five or six sacks. The crates had markings in the Cyrillic (Russian) alphabet. After a brawl, a prosecutor arrested the men and seized the cargo. The search was videotaped by the law enforcement officers. The local governor rushed to the scene and declared that the trucks were moving upon orders from then Prime Minister Recep Tayyip Erdogan (now President). 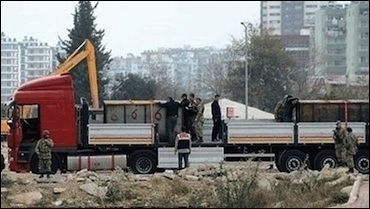 The trucks were handed back to the Turkish intelligence agency, MIT. Erdogan sees Islamic State as a potential ally to topple his regional nemesis, Syrian President Bashar al-Assad. One of the drivers testified that the cargo had been loaded onto the trucks from a foreign airplane at Ankara's Esenboga Airport and that "we carried similar loads several times before." Half a year later, a military prosecutor took charge of the legal proceedings and concluded that "this incident was a military affair." Then came a total media blackout on the mysterious event. Finally, all law enforcement officers who searched the trucks, including the gendarmerie units, were put on trial on charges of "international espionage." The Turkish government insisted that the weapons were being transported to help Iraqi Turkmen, an ethnic Turkish minority in northern Iraq. But the Turkmen deny receiving any military shipments from Turkey and, on the contrary, claimed that Turkey abandoned them in favor of the Islamic State (IS). Everyone knew who the real recipient of Turkish arms supplies was: the Islamic State. In early May 2015, the New York Times reported that tens of thousands of kilograms of ammonium nitrate fertilizer, which could be turned into deadly explosives, were being transported over the border from Turkey into IS-controlled sections of Syria. All law enforcement officers who searched the trucks were charged with "international espionage." Indeed, Erdogan's administration jailed the men who wanted to jail the men for transporting arms shipments to the Islamic State jihadists. A Turkish newspaper, Today's Zaman, published excerpts from the prosecutors' testimonies after their arrest. The excerpts make for interesting reading, especially for anyone who might be thinking that Turkey is part of a Western coalition fighting that Islamic State. The punch line is that some officials in Erdogan's administration had links with IS jihadists and similar organizations in Syria. With the men delivering arms to the jihadists possibly running around freely, looking for new cargoes to deliver to the jihadists, Turkey detained four prosecutors and a gendarmerie colonel on charges of "attempting to topple or incapacitate the Turkish government through the use of force or coercion and exposing information regarding the security and political activities of the state." The prosecutor who stopped the trucks said in his testimony: "If the trucks were ... carrying weapons to Syria, this cannot be described as a state secret. A criminal action cannot be described as a state secret." Right? Right. Missile warheads were found in one of the trucks there. A truck was found to have unloaded some ammunition at a border military post ... on Oct. 6-26, 2013, the ammunition had been taken across the border [into Syria], that security footage proved this and that the ammunition was taken to a camp of the hardline militant group Ahrar al-Sham. One of the prosecutors asked: "Does MIT [the Turkish intelligence service] have a duty to transport weapons?" The investigation revealed that the vehicle escorting the trucks was registered in the name of an al-Qaeda member. The prosecutor questioned how intelligence officials could get on a vehicle belonging to an al-Qaeda member. The weapons in question were transported in an illegal way. The testimonies are spectacular documents revealing how Turkey's "mild" Islamists were -- and probably are -- "fighting" their more savage ideological kin. Turkey and its NATO allies have totally different threat perceptions and goals in Syria's civil war. For the Western flank, the Islamic State and twenty or so similar jihadist groups are a major threat to peace in the region, but for Turkey they, are potential military allies to topple Erdogan's worst regional enemy, Syrian President Bashar al-Assad. Turkey, which supports the Muslim Brotherhood, would like a Sunni, Muslim Brotherhood-type of rule in Syria after Assad's downfall. To that end, Turkey is currently viewing various jihadist groups in Syria as potential political allies to Islamize Syria exactly along those Sunni, Muslim Brotherhood lines.